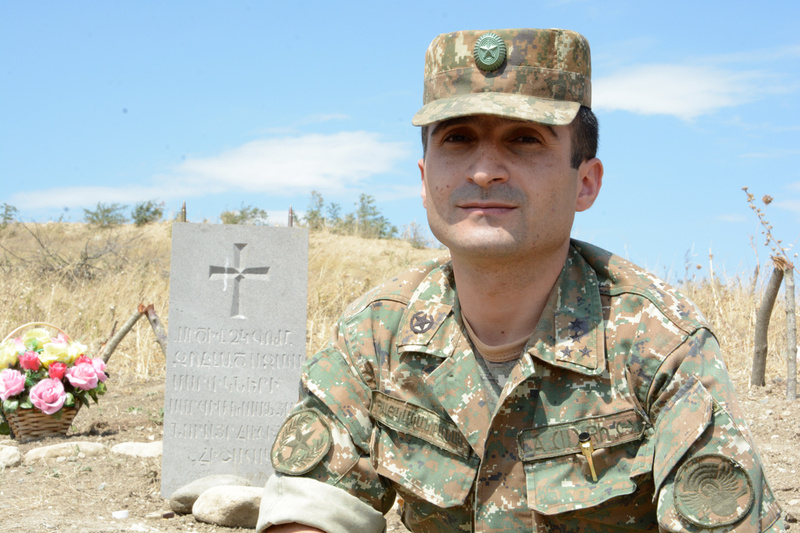 Captain Gegham Grigoryan near a grave just beyond the trenches where a Nagorno-Karabakh soldier was buried this spring. Photo by Knar Babayan. The forward trenches in the hills just beyond the abandoned village of Talish, in Nagorno-Karabakh, are reminiscent of World War I: long, endless, slits in the ground, the dirt buttressed by wood, with periodic firing posts and dugouts. Stacked tires packed with dirt stand in for sandbags, but otherwise it looks like the Western Front 100 years ago. Behind the trenches, alongside the road, tanks are angled to counterattack. 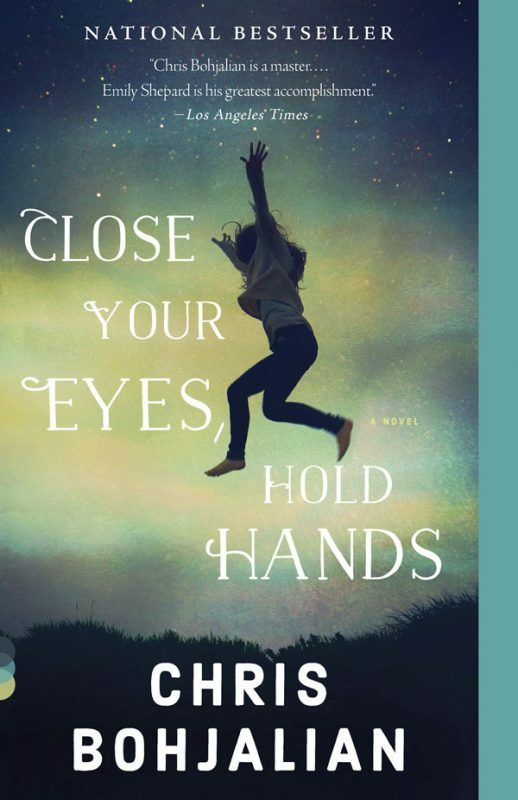 On the first day of September, the sky cerulean, Capt. Gegham Grigoryan, 32, stood with me and pointed toward the northeast — toward Azerbaijan and the minefield and buffer zone less than a mile away. “If you want peace, you should prepare for war,” he said, shrugging. Earlier this year, Nagorno-Karabakh, his small, unrecognized Armenian republic, got war. Azerbaijan attacked across the eastern border in the small hours of April 2, breaking a cease-fire that had largely held since 1994. Here in Talish, the 400-person village was so badly shelled that today it has been abandoned and the residents resettled in other parts of the country. Very few Americans could find Nagorno-Karabakh on a map. (Very few of us, of course, could find Armenia and Azerbaijan, either.) I went there this summer for the same reason that I return every year to Armenia and the remnants of Armenian civilization that are scattered across eastern Turkey: This earth is in my blood, and my visits are a pilgrimage. I am an Armenian-American, but only at midlife did I understand the draw of this ancient land for me. The line of contact between Nagorno-Karabakh and Azerbaijan is strategically significant; it is one of those hot spots that could destabilize the Caucasus. Armenia and Azerbaijan share a border with Iran. After Azerbaijan attacked Nagorno-Karabakh in April, the two sides battled four days before agreeing to a cease-fire. It was a brief, violent conflict involving tanks, artillery and drones that left hundreds of soldiers dead. In the fighting in Talish, Azeri soldiers executed and mutilated an elderly Armenian civilian couple and beheaded a captured Armenian soldier, leading a United States representative, Brad Sherman, Democrat of California and a senior member of the House Foreign Affairs Committee, to call for an investigation into Azeri war crimes. Although the Armenians are Christian and the Azeris are Muslim, the issue has little to do with religion. Azerbaijan insists it owns Nagorno-Karabakh, citing its right to territorial integrity. Nagorno-Karabakh argues that it is entitled to exist independently because of the right of all peoples to self-determination. Certainly there are analysts who argue that the Armenians of Nagorno-Karabakh are an occupying force. I don’t agree. But I don’t side with Nagorno-Karabakh simply because of my DNA. I believe that history is on the Armenians’ side. In 1988, Nagorno-Karabakh’s Armenian majority — then part of the Azerbaijan Soviet Republic — voted to become part of the Armenian Soviet Republic. (In the 1920s, Karabakh’s Armenians had insisted that self-determination was their prerogative under the Soviet constitution. Nevertheless, in 1923, Joseph Stalin gave Nagorno-Karabakh to Azerbaijan.) But the Soviet Union was incapable of managing the violence that erupted — including Azeri rage directed at Armenians in the Azerbaijani cities of Baku and Sumgait — forcing most Armenians to flee to Armenia or Nagorno-Karabakh. On Sept. 2, 1991, Nagorno-Karabakh proclaimed itself an independent country, and for the next three years its Armenians fought a war with the Azeris, which they would win in 1994, with the help of Armenia itself. Somewhere in the neighborhood of 30,000 people would die, and perhaps as many as one million were displaced. Nagorno-Karabakh is largely unrecognized by the international community (though seven American states have passed resolutions urging the United States government to support its independence). The republic is a fledgling democracy of 140,000 people, facing off against an oil-rich dictatorship with a population of 9.5 million. Its only ally is Armenia, which is often the small republic’s lifeline. The Organization for Security and Cooperation in Europe has assigned diplomats from France, Russia and the United States to try to broker a permanent agreement, but they’ve made little progress. After spending time with people in Nagorno-Karabakh, it’s clear to me that the only way the nation will ever again be a part of Azerbaijan is if Azerbaijan conquers it. And despite Azerbaijan’s being vastly larger, I can’t imagine that ever will happen. Armenians had lived on this land for centuries before it was incorporated into Azerbaijan. My first day there I went to a baptism of 39 Armenian children in a church built in 1673. Dadivank, the Armenian monastery in the north, began construction in the ninth century. Its frescoes, which date from 1297, are as lovely as any I’ve seen in Tuscany. Its people are fiercely protective of their home. Among the parents I met at that baptism were Anton and Areknaz Abkarian. Their three children, all under 5, were baptized that afternoon. They have a small farm. But when the Azeris attacked in April, Mr. Abkarian went straight to the front lines as a volunteer. His wife and his mother ran the farm. 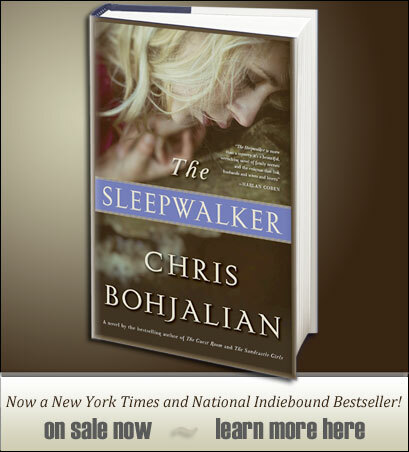 “Who will defend my children and my family if not me?” Mr. Abkarian asked me rhetorically. He is a quiet, unassuming young man, but his smile is broad when he talks about his country or shares the honey from his apiary. The fact is, the only dog Azerbaijan has in this fight is pride. It has the oil; Nagorno-Karabakh has scrub brush and pomegranates. But for the Armenians it is a fight for survival. It is the retention of a part of our homeland. Yes, we were ethnically cleansed from Van and Anatolia and Cilicia — virtually all of Turkey but Istanbul — during the Armenian Genocide. Three out of every four of us there were systematically annihilated during World War I. And so Nagorno-Karabakh is our line in the sand. It is why Anton Abkarian rushed to the front and Gegham Grigoryan traded his suit for a uniform. It is why this small country, as tiny as it is, always has enough soldiers for the trenches. 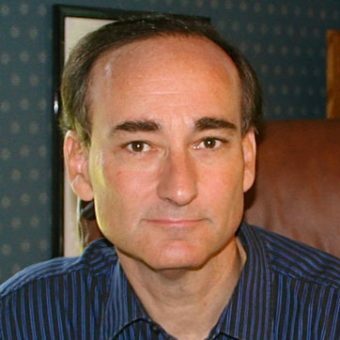 Chris Bohjalian is the author of 19 books, including “Midwives,” “The Sandcastle Girls” and the forthcoming, “The Sleepwalker.” This essay appeared originally in the New York Times on December 7, 2016. This entry was posted in Armenia, Untold Stories and tagged Armenia, Armenian Genocide, Nagorno-Karabakh. Thank you for the history. Praying for peace for your people. Chris: It’s likely you have read Scott Anderson’s book, “Lawrence of Arabia”, but if not it has great insight into the Ottoman Armenian genocide.